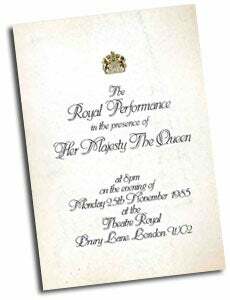 Once more the Theatre Royal Drury Lane played host to the Royal Variety Performance. The Queen and Prince Philip watched as the theme of 'Film Musicals' unfurled before them. In fact, so complete was the theme that no less than five top West-End musicals - Guys and Dolls, Gigi, Seven Brides, 42nd Street and Are You Lonesome Tonight? all closed for the evening so performers could take part in the 'royal show'. There were some great performances - Su Pollard as Gracie Fields, Gloria Hunniford as Doris Day, Stephanie Lawrence as Marilyn Monroe and Sarah Brightman as Jessie Matthews. An undoubted favourite of the night was the wonderful Ron Moody as Fagin in Oliver. The list of stars was virtually endless; Joan Collins, Beryl Reid, Jean Simmons and a number of surprise appearances, including Patrick Duffy (Bobby Ewing in TV's Dallas) and Lauren Bacall. One of the highlights of the night was Dennis Waterman and Maureen Lipman as 'A Couple of Swells', which brought some of the biggest applause of a very successful night. There was an intriguing cameo role for actress Rula Lenska at this performance. She portrayed Hollywood star Rita Hayworth, singing 'Put The Blame on Mame' from the film Gilda, which she prepared for by watching clips from the film a good many times. 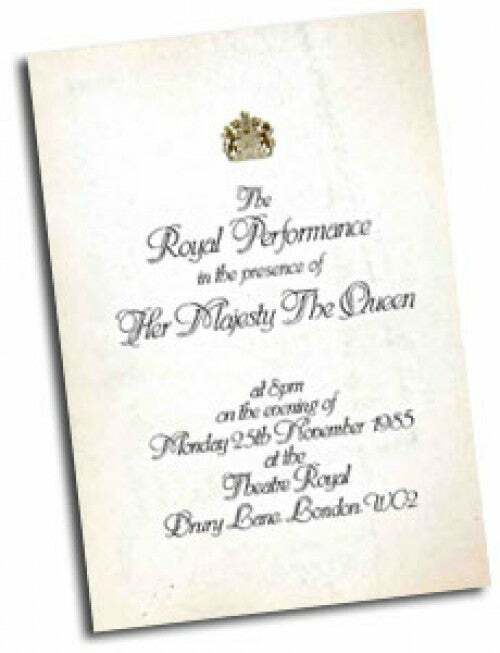 The big headache for the Executive Producer was finding a theatre large enough for 1985's Royal Variety Performance. The Victoria Palace, at which the show had been held the previous year, had 800 fewer seats than the Palladium or Drury Lane and Louis Benjamin was desperate to find a larger theatre. 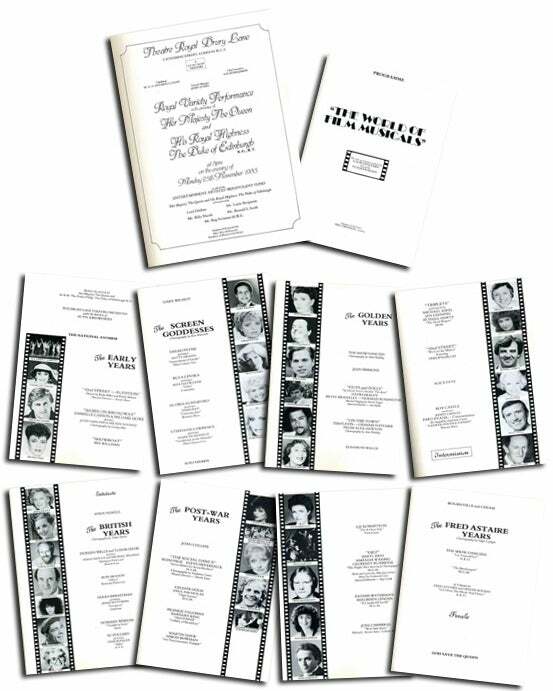 Having dinner at the Savoy one evening with David Merrick, he took the bull by the horns and asked him, "How about shutting the theatre (Drury Lane) for a week to let us do the Royal Variety Show?" To his amazement David Merrick looked him straight in the eye and said "Yes." Bearing in mind that 42nd Street was the resident show at the Theatre Royal Drury Lane and that it was an early musical film, this set the ball rolling for the idea for this year's theme. Two pieces were taken from 42nd Street and added on to these the idea grew and grew, creating a chronology of the film musical. One of the most hilarious moments of the evening came from Wayne Sleep and his dancing partner doing a wonderful send-up of Torvill and Dean as they pretended to skate on the stage. Once again Louis Benjamin had had to struggle to include this against the demands for more orthodox comedy. His judgement was sound once again and the two dancers got more laughs than many stand-up comedians. There were people in the audience in tears with laughter. For Louis Benjamin this was his last year as Executive Producer. He later commented, "For six great years, it was doubly fulfilling for me to have the privilege of doing the shows and to have helped the Fund out." Louis Benjamin died only 7 years later from a long illness, which he had kept very private. Lord Grade said of him, "Louis was a quiet, decent, fine, family man and will be sorely missed by the Grade Organisation, Pye Records, the London Palladium and most of all the Royal Variety"